100% Turkish Cotton 380gsm velour beach towel. Soft velour finish and the reverse side is absorbent towelling. 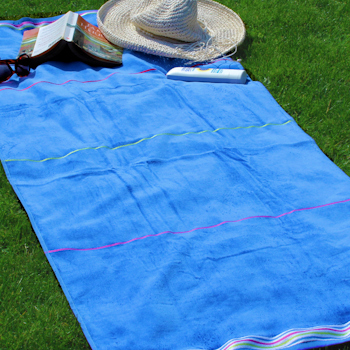 100% Turkish Cotton 380gsm velour beach towel. Soft velour finish and the reverse side is absorbent towelling. Towel measures 70 x 150cm. Bespoke embroidered with your choice of personalised name or initials or text such as His, Hers, Mr, Mrs, Husband, Wife, Mine, Yours... monogrammed on the bottom end of the towel in a complimenting thread colour and font style of your choice. Please enter the exact wording you would like embroidered. Your summer holiday will not be complete without this must have unique personalised beach towel to mark your sun lounger in style!